This epiphanic moment follows a grumbly stomach and a yearning for fluffy pork and chilli stuffed crepes. It also starts on a seemingly ordinary day, sat at my condo peering over local life and the surrounding street food stalls, a day not so different to any other. Soon arrives the smiley crepe lady to the corner, she parks her cart and looks ready to set up for serving. Hunger takes over. Quickly I am out the door, down the elevator and onto the street en route to deliciousness… only to find the crepe lady already disappearing up the road. Panic attacks. As her cart pushes further into the distance I find myself in an ugly dilemma. Either I chase her down mid-journey to pester for a crepe, or, I follow along until she finds her next stop. She’s pushing a street food cart after all so how far can she go. So my politeness gets the better of me and I potter along behind keeping a safe distance to not disturb her. Following a journey into the unknown, a stretch of road I’ve rarely walked before knowing there’s little more than a schools and a dead end. I’ve rarely spent my time lurking outside primary schools… until now. Nearing the end of the road she pulls her cart to the kerbside and I quickly arrive… to find snack-vana. A street food splattering of multi-coloured arrays of all sorts and everything. Naturally I find myself with mixed emotions, excited to find this new world of street food… but at the same time cheated and betrayed by it all. As I walk the line of vendors I pass all my favourites, not one of them capable of looking me in the eye… “What the hell roti guy”. For three years I’ve lived on this street, everyday dreaming of his delightful banana and egg filled pancakes, yet he’s been hiding up here spoiling brats everyday…. “You could have at least told me”. Every known street food cart showed up to be here, rudely abandoning their posts and loyal patronage elsewhere in the area… but I find it hard to stay mad. I quickly join in like a kid on Christmas, kicking through lines of yappy midgets to make the most of one, of very few perks in being a grown up. When your daily routine is as little as mine, moments like these hit like a bomb shell. This was probably the most significant upturn since the new Khao Man Kai (chicken rice) stall from early 2013. Life as we know it will never be the same. The pre-finding-new-street-food days were over. No doubt the entire scenario was troubling, yet at the same time exciting. The days to follow would be unsettling as we contemplate routine and our new daily lives. In the good ol’ days our first meal would start around 1oam, Tom Yum Kai (hot and sour chicken soup) and Kaprao Moo Grob (crispy pork belly with holy basil). Our second meal close to 5pm with Som Tam (papaya salad) and Namtok Moo (grilled pork neck salad) and of course sticky rice. But now we’ve to fit in 3pm snacking? “Maybe eat light in the morning?”…. “but I’d miss my chewy pork belly…”. “What about adding a third meal to the day?”… “but we’re already doubling our weight..”. Troubling. Then comes my Darwinian moment, an epiphany of sorts. Was I witnessing first hand the evolution of street food? As I stand on my balcony, filling my face with a lost-in-translation Katsu Don (a failed adaptation of Japanese pork cutlet on rice) I can’t help question the future of street food but also the story of its past. 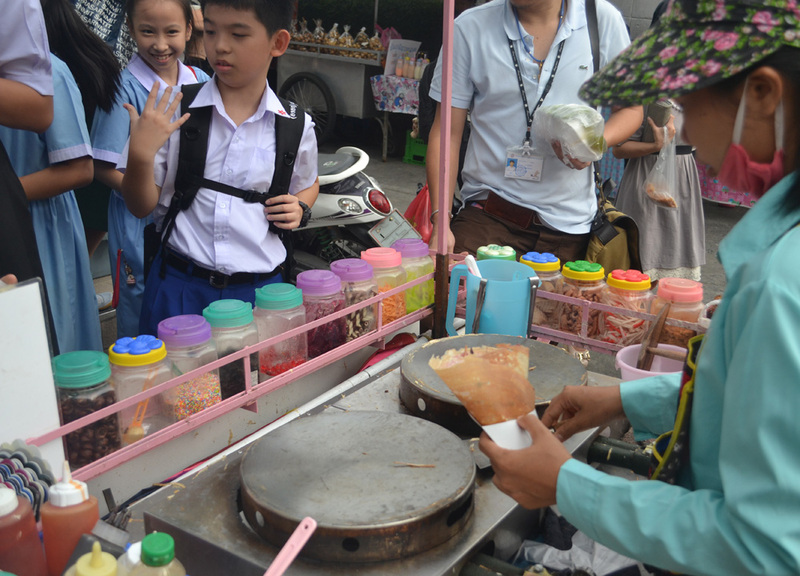 So many street foods in Thailand are taken for granted as being Thai. But how many are in fact authentically Thai? Crepes, French? Roti, Indian? Khanom Jeep, Chinese (shrimp shumi). Few actually bring that distinctive sweet, sour, salty and hot signature which we regularly associate with Thai food. Was there once a day where roti vendors were seen as WTF. No doubt there are foreign influences in Thai street food, the most notable being of the Chinese migrants. But as the city develops as more multicultural will the street food to? Does this mean Gyoza may one day be mistaken as Thai street food? While I’m all for it, I can’t help feel sentimental, and somewhat sad. Disheartened like the deliciously plump Isaan sausage. “Will you be left behind Isaan Sausage?”. I doubt it. Thailand has a world renowned street food reputation because it has the best street food in the world. While I may occasional find cravings for that delightfully tart Gyoza sauce – I know my heart will always lie in Isaan sausage.